Phyllis Pickle has been in the restaurant business for well over twenty years. You have probably seen here before and if not, you most likely have tasted the food that has set her apart. Her restaurants included ones that were well known and well liked across the Birmingham area, including Sun's Chinese on Greensprings Highway, Sun's Buffett at Loman Village in Hoover and Jade Palace on Highway 280. Her newest restaurant venture, located at the corner of Highways 58 and 95 in Helena, Alabama is certain to attract the same crowds and attention. Serving an international menu with varying selections from Chinese and Japanese to Thai and Indian, don't think that Phyllis menu is limited to just the international fare. She if fully aware she lives in the south and cooks in the southern style to appease those of us that prefer it "like momma fixed it" too. Their menu section dedicated to Southern Home Cooking comes with such offerings as garden fresh vegetables prepared daily with traditional entrees like meat loaf, hamburger steak, fish, shrimp, oysters, chicken fingers and wings (that a friend of mine insist are some of the best he's ever eaten). It's Phyllis work ethic, visualization and creativity that produces City Cafe's stand out dishes like their Japanese Teriyaki section with shrimp, chicken or beef is served over rice and a medley of vegetables in a teriyaki sauce simmered for hours. 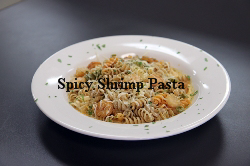 The Spicy Shrimp Pasta ($10.99) Shrimp sautéed with creamy Cajun sauce and healthy whole wheat and vegetable pasta. It is the most remarkable dish. But it was the Ta-Ta Chicken ($9.99) that struck the fancy of most at the table. 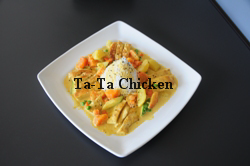 Prepared with flavors of Indian curry, sautéed with carrots and potatoes and served with steamed rice it was a delicacy! The flavors married like Fred and Ginger, creating a most magnificent dance for the palate. Somewhat spicy, and oh-so-good! It will be what I get when I visit City Cafe in the future. And their will be future visits! Turnip Greens, Steamed Carrots Black-eyed Peas, Corn, Green Beans, Pinto Beans, Cabbage, Mashed Potatos, Butter Beans, Peach Cobbler (almost as good as momma's), Fried Green Tomatos, and Deluxe Mac & Cheese..and this is not all the choices! I selected the carrots that seemed to be in a honey sweet broth, pinto beans (that my most finicky child licked clean), corn and the delux mac and cheese (that is so rich and gooey it counts as 2 sides). The mac and cheese is prepared with spiral noodles that hold onto its four cheese sauce so well. Mention that it is your first time to City Cafe to restaurant owner, Phyllis and she will probably personally bring to you a serving of her peach cobbler. She's not worried, She knows you will be back for more. City Cafe offer's a kid's menu too. My two children both gave a thumbs up to the Kids Fried Chicken Fingers / Fries/drink $4.99. 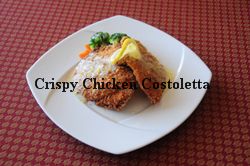 The chicken fingers are not frozen, but are hand cut and breaded. My husband managed to pry one from one of our children and commented on how delicious that it was. Phyllis personally makes the honey mustard sauce that is served alongside as a condiment for the chicken fingers. It's this attention to details and the starring dishes that truly make City Cafe a local favorite. 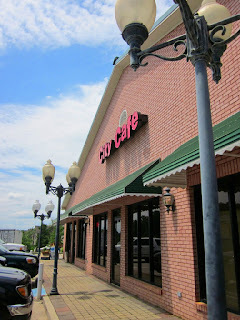 And for those who are not local (like a couple who had driven all the way from Huntsville just to dine at City Cafe) you will find, the quality and taste are with the drive. Bring the whole family for lunch or dinner but, please, leave room for dessert! Phylis has that covered too.